JONATHAN GOLDMAN, M.A. is an international authority on sound healing and a pioneer in the field of harmonics. He is author of numerous books including Healing Sounds, The 7 Secrets of Sound Healing and his latest book The Divine Name, winner of the 2011 Visionary Award for "Best Alternative Health Book". Jonathan is director of the Sound Healers Association and president of Spirit Music, Inc. in Boulder, Colorado. 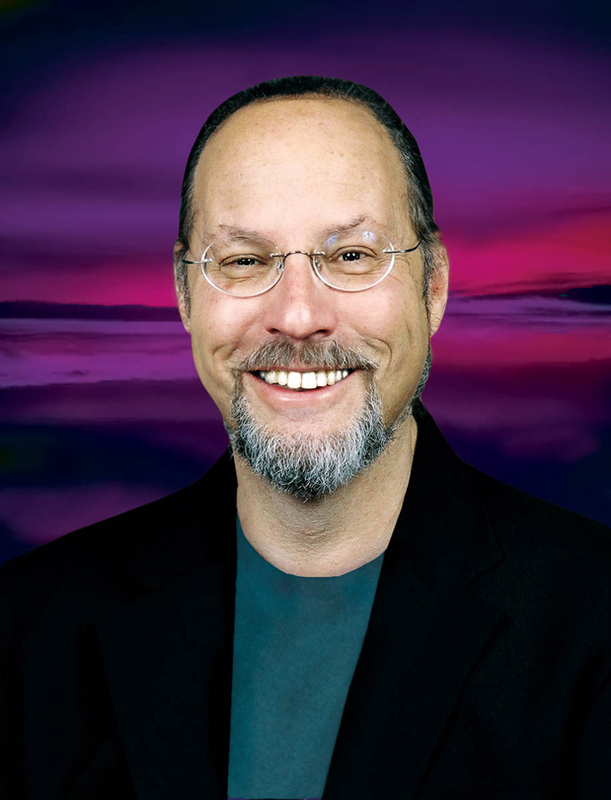 A Grammy nominee, he has created over 25 best-selling, award winning recordings including “THE DIVINE NAME” (with Gregg Braden), “REIKI CHANTS”, "FREQUENCIES,”, “ASCENSION HARMONICS”, “CHAKRA CHANTS”, and his latest “MERKABA OF SOUND”.Jonathan is a lecturing member of the International Society for Music Medicine. He has dedicated his life to the path of service, helping awaken and empower others with the ability of sound to heal and transform. In Spring 2011, Jonathan was named as one of Watkin’s Reviews “100 Most Spiritually Influential People on the Planet.” Also, in 2011, Jonathan was inducted into the Massage Therapy’s Hall of Fame. Sacred Music Radio was fortunate to sit down with him and discuss the development of sound healing and the role sacred music plays in improving our health. What drew you into studying music and the impact it has on a person? I had an experience that changed my life. I had been playing professionally in rock and roll bands since the age of 16, in between going to college, and one night I was playing in Cape Cod. We came in from a break, and started playing and I became aware that the ambience in the club was one of negativity and violence. Understand that, no doubt the alcohol that people were consuming contributed to the atmosphere, but I realised that the music I was creating was not helping the situation. I had the thought- what if music could be used to make people feel better? You have to realise that this was back in the late 1970s- it was a wild time. About two weeks later, this thought shifted slightly, and I started to consider: what if sound could be used to heal. That thought literally shook me to my core. A few days later, someone handed me a piece of paper, and it was a flyer for a workshop on healing with sound, created by a person called Sarah Benson. I took the workshop, and it changed my life- I had a divine experiences in the class, and Sarah has since became a dear friend to me and my wife. I dedicated one of my books, the Seven Secrets of Sound Healing, to her, and we call her the Divine Mother of Sound Healing. From this experience, I founded The Sound Healers Association. Incidentally, I do not think that dance music or rock and roll music is bad at all. For example the Beatles ‘All You Need is Love’ or their song in which we are told “The love you make is equal to the love you take.” is some of the more extraordinary spiritually uplifting music on the planet. But at the same time, the music I was creating was punk rock/new wave music- it was the only thing you could do as original music at the time. In truth, it was not really positive music. Because of my revelation about the potential healing nature of sound and music, I took my record company, and we became one of the very first therapeutic music companies on the planet. I totally changed everything about the type of music we used, apart from one thing- the name of the company. The company, for some reason, was called Spirit Music. To this day, it is still Spirit Music, and the company is getting on for 35 years. You yourself established a degree programme on sound healing because of the lack of higher education on the topic- how have you found the success of sound healing in further education since establishing the degree? I went to school, had my Bachelors Degree in Filmmaking, and then later on, as I began researching the power of sound to heal and transform, I decided to try and get a masters degree. I went to Lesley University in Cambridge, Massachusetts and created a programme that looked at the use of sound and music for healing, and to this day, I believe it still exists as an independent subject for people. I came across someone who had her doctorate on the subject from another university. So I imagine this area of study continues to grow. I was originally involved in a doctorate programme which focused on the use of sound for healing, but dropped out after my first book was published. What’s interesting is that most of the focus within higher education has been on the therapeutic aspects of music- music and the brain, music and this and that. Yet, in my latest look, I specifically look at using self created sound because we can all make self created sounds- we can all do some form of singing. It is very different to getting up and singing “God Save the Queen” or some other song, because that is more entertainment. Here, we are talking about using sound as a vehicle to shift and change your brain, your body and your aspiration. This is called entrainment and it is an aspect of physics. When you sound in this manner, you are able to shift and change your vibratory rate. You are at a level of healing and in touch with a higher level of consciousness, manifesting mediation; mindfulness and generally making yourself and other people feel better. In your work, you have looked at mantras and chakra frequencies. Could you explain the impact these sound have on the mind and body? We found that when people hear sound, they think of music, and then say don’t know how to play an instrument, so therefore cannot take part. But everyone can, as we are talking about simple, basic sacred sounds, such as “oooo” or “ahhhh” or “Om”. This is one of the reasons why mantras and chakra frequencies are so effective. You don’t need to have a technically good voice or be well versed in music in order to experience the positive effectives. Obviously many of the players on Sacred Music Radio are esteemed musicians, but you also feature music that t is communal, which is very important. It increases the oxygen in us, lowers blood pressure and heartbeats, increases lymphatic circulation and produces increased levels of melatonin. Melatonin is used by people for various things- helping to sleep, depression and hormone levels. We all know how powerful stress is in terms of causing illness. If we can reduce stress, we can really heal ourselves. You also get an increase in nitric oxide, which is a molecule associated with the emotion of healing. It is a vascular dilatator, which means it basically opens up and helps the flow of blood through our body. Endorphins are also released, which are those wonderful self-created opiates, which release these natural pain relievers. You have helped co-ordinate World Sound Healing Day, could you explain to the readers the aim of the event? First and foremost, the idea behind World Sound Healing Day is that hundreds of thousands of people throughout the world, stop for 5 minutes and begin to breath slowly and deeply to create heart-brain coherence, which is where your heart and your brain synchronize and then they make the “ahhhh” sound. They make this sound for about 5 minutes with the intention of creating a sonic valentine for Mother Earth—the Gaia Matrix. The idea is that this encoded sound of light and love can literally shift and change the consciousness of all living things on this planet. Now this may sound like a crazy thing at first. But the heart gives out a electrometric field, as does the brain and when they are in coherence, the field that is created can be anything from 500-5000 greater than when they are out of sync. Then we add the components of sound. And this sound is encoded with the energy of compassion and love. We have people making this sound coupled with the intention of sending love to the planet and it is extraordinary. This idea initially stems from the work of The Global Consciousness project, which is out of Princeton University as well as being coupled with HeartMath Institute in California. With the Global Consciousness Project, they have random number generators, which are computers that just puts out zeros and ones. This is the mathematical equivalent of flipping a coin- out of 100 times you will get 50 zeros and 50 ones. Except, they found that when incidents occur of high compassion, the numbers become less random- you have more ones or more zeros. Now because during events of high compassion, these numbers are so different you can actually graph the results. Normally, if the numbers were even, you would have a straight line. On the World Sound Healing Day website, we have a graph, which looks like a small Mount Everest, which occurred on a prior World Sound Healing Day. This seems to have occurred because of the event of World Sound Healing Day. We are talking about events of high compassion, not events of high excitement such as a sporting event, but rather events like meditation or global prayers such as World Sound Healing Day. From my perspective, there is a reason why the majority of prayers on our planet are vocalized—they are chanted, they are sung, they are whispered, they are spoken. I believe that very simply sound amplifies the power of prayer. This is one of the reasons why events such as World Sound Healing Day are so effective. So the idea is that we can literally interface with the energy field of the earth and create shift and change. We have people across the world getting together and doing events where they sound together for 5 minutes. We do an event in Boulder, Colorado where I live and we get a few hundred people together to sound out an ahhhh sound. In the middle of all these people is a crystal bowl filled with water. At the end of making this ahhhh sound, we hand out cups of water from this bowl and the water is so sweet because the vibrational structure of the water has been changed by the sacred sound. A lot of people have not been in situations where they themselves are taking part in making a sound for half an hour or longer and it becomes an amazing spiritual experience. Your nervous system changes, and hormones are released. It is just extraordinary. You have studied with numerous masters of sound from both the scientific and spiritual tradition- who was the most inspiring? There was a French Doctor, Alfred Tomatis, who recognised the significance of Gregorian Chanting. In the 1990s, Gregorian chant became very big, and this was due to Dr. Tomatis. He explained how Gregorian chant uses sounds that are high in harmonic frequencies and this stimulates our brains, making us feel better. I want to honor Dr. Alfred Tomatis. Also, I had as a mentor Dr. Peter Guy Manners, from England, who had dedicated his life to working with sound as a healing modality. He was one of the great pioneers in the field of sound healing. He even invented an instrument, which used direct application of sound on the body for healing. Looking to the future, how do you see the field of sound healing progressing? My wife and I are finishing a new book on sound. It will be out next year, and we’ve found that the more we research this, the more powerful the evidence is for the impact sound can have. We’re dealing with a sound that anyone can make and yet It’s also an advance yoga sound,. While I’ve never been much of a researcher, as I dropped out of my Ph.D. program to pursue my teaching of sound healing, the scientific and medical evidence about the healing nature of sound is quite amazing. More and more data is manifesting. In the new book, my wife and I are ultimately presenting a hypothesis to suggest that self-created sounds can make new neural synaptic connections in our brain. Such a phenomenon would assist healing people with head injuries and various types of illness in the brain. We now have an understanding of neuroplasticity in the brain, which means we can regenerate and grow new portions of our brain. I believe self-created sound may be one of the simplest and most direct methods of doing this. . I’ve been working on this for several years and it’s a really interesting and exciting aspect of the potential of sound to heal. One of the main areas we focus on at Sacred Music Radio is the role it has in uniting people from various faiths-how does sacred music achieve this? When you make sound together with someone, you get a release of oxytocin and all the barriers that may have existed before hand, all of a sudden disappear. That’s one of the reason that people resonate together when they experience sacred music—particularly when they all sound together. All those wonderful levels of oxytocin occur and bring everyone together. At the same time, of course, when we resonate to the energy of sacred music, we are entraining with the Divine. What could be better? After having looked at Sacred Music Radio, and gained a better understanding of its aims, what direction would you like it to head? I think it’s so wonderful that you are presenting all this sacred music from across the planet; it’s a brilliant thing. I think that any music that connects you to the Divine is sacred music. Sacred Music Radio lets music interface together. It uplifts them and lets them have a deeper connection to the divine. I want to leave you with a quote that a friend of mine said. He said ‘sacred sound is the mystical state in vibratory form’, I thought it was great. World Sound Healing Day- Any sound or thought we have, we heal the planet, we heal ourselves, we heal ourselves and we heal the planet. You can make a difference, it’s our choice.